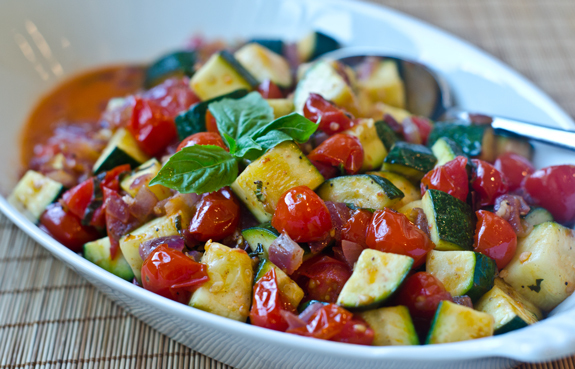 A side dish of crisp zucchini, burst cherry tomatoes and meltingly sweet red onions sautéed in olive oil. As much as I love fall produce — thoughts of Honeycrisp apples, winter squash and sweet potatoes are already dancing around my mind — I’m not quite ready yet. So here’s one last hurrah for summer veggies: a side dish of crisp zucchini, burst cherry tomatoes and meltingly sweet red onions sautéed in olive oil. If it sounds basic, it is, but it’s one of those dishes where the whole is far greater than the sum of its parts. Pair it with grilled salmon and some orzo doused with lemon and olive oil for a light and easy weeknight meal. Begin by chopping the vegetables. Be sure to cut the zucchini in large chunks because you don’t want it to cook too fast and get soggy. As far as zucchini is concerned, crisp is always the name of the game. Next, heat the olive oil in a large sauté pan and add the red onions. Cook, stirring frequently, until the onions are very soft and pale purple. Add the zucchini, tomatoes, garlic, salt and pepper. Cook for 3-5 minutes, until the zucchini is cooked but still crisp, and the tomatoes have started to collapse, creating a little sauce. Stir in the fresh basil, season to taste and serve. That’s all there is to it. Enjoy! I have made it and left the basil out and it’s still amazing. I love this creative combination!! So pretty and delicious! We love them! Love this, I changed it a little to match with the Middle Eastern Chicken Kebabs by adding a little cumin and cinnamon to try and carry through the flavors. Matched really well. Hi, I made your recipe and it looks and tastes good. One comment is 3-5 minutes to cook zucchini is too short of a time. Also, because I added the zucchini and tomato at the same time to the pan, the tomato fell apart and the skins were floating. Do you think you should cook the zucchini halfway first and then add the tomatoes? Hi Teresa, Sure, if you’d like your zucchini a little softer without overcooking the tomatoes, I’d add them first to soften up for a few minutes and then add the tomatoes. Hope that helps! This is sooo good! I love your recipes! Thank you! I loved this! It was nice and light. I served this with salmon. I did add some spinach but is perfect as is! I made this and loved it! Just wonder if you could freeze it?? Hi Jackie, Unfortunately, I don’t think the zucchini will hold up well. Sorry! Another fabulous recipe by Jenn! So nice! I’ve always made this combo of vegs but never with the details that make this stand out in eye appeal. Chunky zucchini, red onions and pop of cherry tomatoes(I used yellow) it’s beautiful, healthy, easy and perfect! I’ve make this dish many times – it’s fantastic and easy to make. 1. Use half green and half yellow squash and follow the recipe as written. 2. When it’s time to add the tomatoes, remove the pan from the heat, add the tomatoes, a large handful of mozzarella cheese, and the basil. Cover & let stand for 5 minutes then serve. This goes great with a grilled steak or chicken. Thank you for this recipe, Jenn – love your site. This is a go-to recipe for me! I have recently lost 45 pounds so lean proteins and veggies are must on my menu. Only changes I made were avocado oil in lieu of olive oil and I cut way back on salt – every man for himself with the salt shaker. If you have a garden, you know how abundant cherry tomatoes can be. Everyone knows about zucchini too… With those thoughts in mind, I’m always looking different for ways to use these. This relatively simple dish is a huge winner. I tend to make it just as written. If I have some bacon fat with nothing to do, I’ll use that instead of the olive oil, but the combinations here are perfection without it. Best veggies of the summer! I made this side dish last week exactly as written in the recipe. It is both beautiful and yummy. Will be making routinely. Who would thunk that a zucchini recipe would be a family recipe. However, every time I say that I am making this recipe I get smiles and high fives. Flavourful, easy and quick to make and its vegetables! Who knew. The trick is to keep the zucchini al dente, not to overcook and I find that it is ready just when the cherry tomatoes start to give up their juice. Love, love, love this recipe! I have made it numerous times exactly as written! So easy & full of flavor! I usually serve it as a side with Chilean Sea Bass for company! Always get rave reviews! Thanks Jen!! Made the zucchini and tomato dish. it was good, but the addition of crumbled feta added a lot of flavor and was pretty with the green and red. This was so easy, pretty, and most importantly YUMMY! I was having some friends over for dinner and almost didn’t make this because I thought it was too simple to impress. I’m so glad I made it anyway! It was perfect and I can’t wait to make it again! Everyone loved it and it was so easy. Thank you!! It was very good. I had to use a high heat to get the zucchini to brown which decimated the tomatoes, but since my family only likes cooked tomatoes it worked out great. I used 3 zucchini because I wanted to use up what I had on hand. Everyone loved it. Great flavor. Excellent and so easy! A perfect way to use the small tomatoes and zucchini from our CSA. Hi Jen – I switched this up a bit when I made it last week. Used summer squash and heirloom tiny tomatoes ( red green brown yellow ) I should have taken a pic to share ! I served this side dish with the lamb burgers and they were the perfect complement for the lamb, also served the zucchini with feta and dill to prepare a Greek inspired meal, along with a nice pilaf! I love this recipe! It’s mid March, but I made it this week, because I love it! Zucchini can be so bland, but this combination is just perfect, great flavor and perfectly tender crisp! I use the size guidance on the rare occasion I make zucchini and don’t use this recipe! Its perfect! This is my favourite zucchini dish of all time! For once, my effort cooking with zucchini didn’t turn into a soggy, tasteless mess. I love the flavour combination of the ingredients and the cooking instructions are spot on. I know this is meant as a side dish, but I could just eat this on its own…and I often do! So, so delicious! By the way, this review is way past due. I’ve been making this for close to 2 years. In fact, it’s because of this recipe that I started subscribing to your recipes Jenn. I have stacks of cookbooks, but your website is now my first go to place when looking for ideas. So thankful you share your incredible cooking talent with us! Thank you, Kasia! So happy you’re enjoying the recipes ?. I made this dish all summer long! Great as the recipe is written. Can’t wait for zucchini from the garden to make it again. Absolutely LOVE this recipe! Was trying to find something a little different for veges, and this hit the mark! Great flavor, easy to put together. Thank you!! I love this recipe. Everything goes perfectly well with eachother and its easy. I find that my zucchini always cooks faster than the way I like my tomatoes cooked, so I put my tomatoes in first and let them cook up really good before I add the zucchini. This dish is amazing! My kids love this and it as hard to get them to eat zucchini. I like this dish with simple grilled chicken. It is also a great sauce for pasta! I’ve made this recipe over and over again…and it NEVER disappoints. Such simple ingredients, but so elegant. Another winner!!! THANK YOU JENN you never let me down! I always know I’m going to serve a delightful meal when I use your recipes. I can’t believe it took me so long to make such an obviously yummy side dish. It will be yet another staple at our house. This was delicious with garden fresh vegetables! Very easy and simple but flavorful! Quick, easy and tasty. It was yummy even though I used a 1 lb. chunk of a giant zucchini that my neighbor gave me. I suspect it would be even better with smaller, more tender zucchini. one year after….. or so! made this in exactly the same way as you wrote and found your recipe because I thought I would like to see with how many gorgeous recipes for zucchini the web is coming up…. I made this last night as part of a vegetarian dinner. Very delicious and I love how it showcases summer vegetables. Thank you for the recipe! This is not only a delicious dish, but it is also beautiful, cheap, healthy & easy! I’ll be making this a lot more often. This recipe is fantastic! I’ve made it four times already. I have tried numerous ways to get my husband to eat zucchini, and this is finally it! He actually likes it, not just tolerates it. Thanks for the great recipe! Hi Jenn! Just made this recipe yesterday for my week’s lunches! I love it! I really enjoyed the touch of basil flavor in every bite! I love zucchini…and yet manage to overcook it from time to time. Not this time, thanks to your great instruction it is PERFECT! Thank you for sharing your skill! Made this delightful dish a while back when the tomatoes were really in season and it was so easy to make and so delicious! Hi Jen, do you think the sautéed zucchini and cherry tomatoes would go well on couscous and paired with your mirin glazed salmon? My children look forward to dinner everyday and you’re my favorite cooking companion :). Many thanks! Hi Kristine, Thank you for the wonderful feedback and I’m so sorry for the late reply! I think this dish would go wonderfully with couscous and simply grilled or broiled salmon (with just salt, pepper and olive oil). This is a great side dish. You could make it the main dish by adding black beans and cheese or sausage would be good. While camping recently I shaped aluminum foil into a pan, then cooked this dish over the grill. It was great. Summer is over and I made this recipe one more time. Like several of the reviews I read, I too, paired it with salmon and was very pleased with the result. Earlier in the season I made it as a pasta topping. It is top of my list of zucchini recipes and will be early on my list next summer when the season starts all over again. Can this be eaten cold or reheated? Great balance of flavors for a simple dish! Thanks! Just made this for dinner. So easy and just so delicious! Thanks, Jenn, for yet another wonderful recipe. The zucchini, onions and tomato dish is a perfect topping for rice or pasta. Either way, our grandchildren inhale it. I’ve made this a couple of times now. The first time I made it, I used grape tomatoes, but found that they didn’t provide as much juice as I’d hoped. The second time I used chopped Roma (or plum) tomatoes. I found them to be much juicier and an improvement over the cherry tomatoes. I tend not to keep fresh onions or garlic in the house, so I used dried onions, garlic powder, and dried basil. I probably missed out on some flavor freshness this way, but I still loved the recipe and will continue to make it. I was happy to find this recipe because I have zucchini, tomatoes and basil growing in my little back yard garden. It was absolutely delicious, and so quick and easy to put together! This dish was super easy, fast, and also delicious. Wonderful taste and textures. This is a fantastic side for any entree! For some reason, in 36 years, I’ve never thought about cooking zucchini this way?! Thank you Jenn for for the brilliant idea! The chunking of the zucchini kept it crunchy and the onion, garlic, tomato, and basil made it even more delicious! My entire family ate it all! This side dish was the first recipe tried from the onceuponachef.com site. I am now a follower and continue to come back here to try more recipes. This side was a simple, yet tasty dish and allowed me to use up veggies I had on hand. Seasoning was good – not fancy. My husband and sons even commented we should have it again (which was surprising since I don’t normally get such positive comments on dishes with cherry tomatoes. I made this exactly as described and it turned out perfect! Absolutely delicious! Next time, I will choose a smaller onion than what I had on hand today. 🙂 Thank you Jen! Your website it my favorite “go-to” for recipes. Every single dish I’ve made of yours has been 5 stars! Is this strictly served warm or would it be good chilled? Loved this. Reduced the onion (personal taste), added linguine and feta for a main dish! This recipe turned out great! I was pleased that the zucchini stayed firm and didn’t turn to mush, which has happened to me in the past. Also, I added red pepper flakes for a bit of heat. I’ll definitely make this again! I made this last night. I didn’t have enough zucchini so I used asparagus. It was easy, delicious and impressive looking. I sent the recipe to my daughter. This recipe is definitely a keeper. This is such as easy and refreshing side using fresh summer veggies that I seem to always have in my kitchen. Important to cut the zucchini in large chunks. I sliced it in quarters, then chopped in large chunks. Then you want to add to the sauteed onions and cook for no longer than 5 minutes to keep each chunks slight crispness. Any longer and it will be mushy chunks. Simple, fresh ingredients along with chicken kebabs was a great pair! Great little summer side dish! Even though you cook everything, it feels very fresh. We’ve had as a side to both pork and chicken, and I think it would go great with steak too due to the tomatoes. I’ve substituted yellow/ sweet onions for the red onions and it’s gone over quite well. The recipe is just TOO easy to pass up! This is my go to recipe for bbqs! It just screams summer. I made it just as directed. Another winner, Jenn!!! Review: I tried this recipe and found it timely as I had some zucchini laying around. It was delicious! The melding of the flavors was like a festival in my mouth! Yum!! Thank you! I truly enjoyed this recipe, it was so easy to make. We’ve made this for years.. In texas summer squash and zucchini are a garden staple. I cheat with minced garlic from a jar, and usually a dry herb added while cooking the tomatoes at the end. Simply delicious! Would not change a thing. This recipe looked absolutely delicious, and contained things that I love. However, mine did turn out soggier than I anticipated. Based on the photos, I think my zucchini, onion, etc. were chopped to similar size. Not sure if my tomatoes were overripe or if my temperature was too high. I will have to try again. Hi Paula, Yes, it’s important not to cut the zucchini too small, otherwise they cook too quickly and get soggy before the tomatoes are done. Or maybe just cook it less next time. Just made this tonight – it was delicious, and so easy to throw together. I served it as a side dish to a plain grilled salmon and white quinoa and it added some nice color and flavor. Thank you for such a great and easy recipe! This recipe was a perfect choice to use up extra summer garden produce. We have a large family, so I doubled it and made it on two large pizza pans in a 400 degree oven. The oil and onions went in first for about 8 minutes, stirring once. The other ingredients went in for 9-10 minutes total. Looking forward to a chance to win the Analon Cookware set. I’ve made this twice now, and served it alongside brown rice and grilled salmon. It’s absolutely fantastic! We substituted Mrs. Dash for the salt the 2nd time around to keep it lower sodium for a friend joining us for dinner, and it was just as tasty! This recipe was easy to make and so visually appealing! I am not a big zucchini fan, but this was delicious. We served with some NY strip steaks and grilled bread. My husband said it tasted like very fresh ratatouille and ate his on top of the bread. Nice easy recipe after a busy fall weekend. Thank you, Jenn. Nice one! I make a very similar dish but omit the onion and add halved brown button mushrooms instead, with a knob of butter added at the end. The hubby’s favourite summer side dish. Whenever I see a new recipe from you in my inbox, I get WAY more excited than I probably should. Seriously, you have the best, most consistently reliable recipes of any food blogs I follow. My family and I have loved every single one I’ve made (which is many!). That said, I will be making this ASAP. Thank you for being awesome! Perfect for a Sukkot potluck we’re invited to! Thank you!